Mostyn Moreno Foundation held its 3rd annual Joe Moreno Charity Classic presented by AT&T. 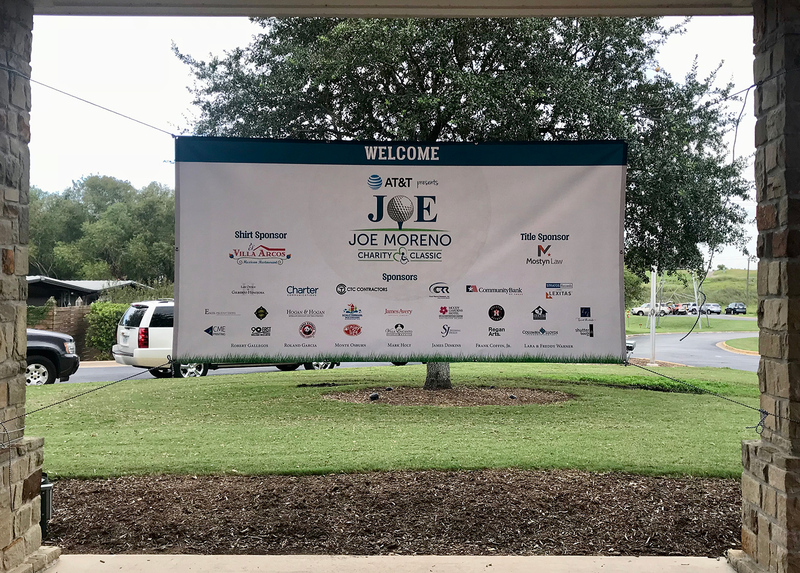 On October 2, 2017, the Mostyn Moreno Foundation held its 3rd annual Joe Moreno Charity Classic presented by AT&T. The annual event features a VIP reception, a tournament, live auction, awards presentation, and dinner. The tournament is named for former state representative Joe E Moreno who passed away in 2005. His sister Sarah makes it clear that Joe treated his friends very well and wants the entire experience of our sponsors and golfers to reflect Joe’s standards. Joe would be proud of the event named in his memory. The reception was held at the elegant Hotel Zaza, where VIP guests sampled many delicious hor d’ouerves followed by a selection of wines and beers. Guests were entertained by strolling magician Mike Toy. He made his way through the room, providing guests with feats of sleight of hand and magic, much to their amusement! The reception concluded after foundation founder Steve Mostyn made a few remarks noting his close personal friendship with Joe Moreno that lead to the foundation bearing his name alongside Steve’s mother’s name. Steve also spoke briefly on the foundation’s mission to provide for special needs children. In both instances, Steve shared some wonderful insights and stories that captivated our guests and solidified the importance of our work and the appreciation for our friends and supporters. Late the following morning at Wildcat Golf Club, golfers gathered together on a beautiful day for golf. Each picked up their gift bags, tournament shirts, and caps before heading to the lunch buffet of hamburgers with all the trimmings. The gathering of 23 teams teed off at 1 PM for a day of golf, fellowship and, for some, serious competition! After a full round of golf, the golfers and our group of dedicated volunteers assembled in the dining room for a feast of award-winning BBQ, entertaining live auction, and the presentation of awards.